One Afghan and three Bulgarians found responsible for suffocation of 71 refugees in a truck in 2015. 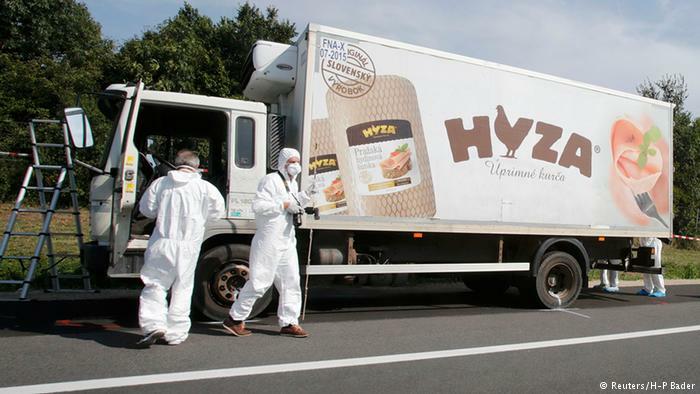 Hungarian police have arrested the driver of a lorry found on an Austrian motorway with the decomposing bodies of 71 people, including a baby girl, inside. Three Bulgarians and an Afghan man have been detained, police said. Detectives have also questioned almost 20 people and searched homes, they added. Earlier Austrian police said the lorry owner was a Bulgarian citizen of Lebanese origin. The death toll was raised on Friday from initial estimates of 20 to 50 following the discovery of the remains on Thursday morning on Austria’s A4 motorway between Neusiedl and Parndorf. The truck, which had been abandoned on the hard shoulder of the road near Parndorf, had apparently been there since Wednesday. Austrian police said all those on board appeared to have suffocated and died before they entered the country. Austrian police said of the 71 dead, 59 were men, eight women and four children, including a baby girl. The girl was between one and two. The three other children were boys, aged between eight and ten. At a news conference in the town of Eisenstadt, Hans Peter Doskozil, police chief for the province of Burgenland, said one Syrian travel document had been found among the victims but that it was too early to say from which countries the entire group had come. The lorry set off from Budapest in the early hours of Wednesday morning, and reached the Hungarian-Austrian border by 9am. It crossed into Austria that night and was spotted on the A4 at 5am or 6am on Thursday, police said. The 7.5-tonne vehicle used to belong to the Slovak chicken meat company Hyza and still has the slogan “Honest chicken” on the side. The company said it sold the lorry in 2014. According to the Hungarian government, it is registered to a Romanian citizen from the central city of Kecskemét. Road officials said on Thursday that an employee mowing the grass alerted police after noticing putrid liquid dripping from the back of the white refrigerated vehicle. Its door had been left ajar. Detectives then made the grim discovery. Forensic teams at the scene examined the lorry, which has Hungarian number plates. Lindsey Hilsum of Channel 4 News tweeted that the “smell of death” at the scene was overwhelming. On Thursday afternoon, police towed the vehicle to a nearby hall and began removing bodies. On Tuesday, meanwhile, Austrian police arrested three drivers on suspicion of transporting migrants from Syria and other war-torn areas into the EU. One of them had driven 34 people packed into the back of a white van across the Austrian border. The group included 10 small children, whom the driver abandoned by the side of the motorway near the city of Bruck an der Leitha. According to police, the migrants said in interviews they were hardly able to breathe during the trip. They had asked repeatedly for more air, but the driver had ignored their requests, police added, and had driven without stopping from Serbia to Austria. Amnesty International’s Europe deputy director, Gauri van Gulik, said countries in the region needed urgently to do more.